A 2009-2010 survey of more than 5,000 U.S. adults over the age of 20 shows that while 49 percent of Americans eats at least one sandwich a day, those sandwiches contain much more lettuce and mayonnaise than the strong emotion that makes all sandwiches taste better. I blame the Centers for Disease Control and Prevention. The CDC conducted the "What We Eat In America, National Health and Nutrition Survey", the results of which were recently published in the Journal of the Academy of Nutrition and Dietetics. Considering the serious nature of that organization's work (they've got Ebola at their headquarters some 15 miles from my house), I suppose I cannot fault them for not recording how much love went into the average American sandwich in 2009-2010. 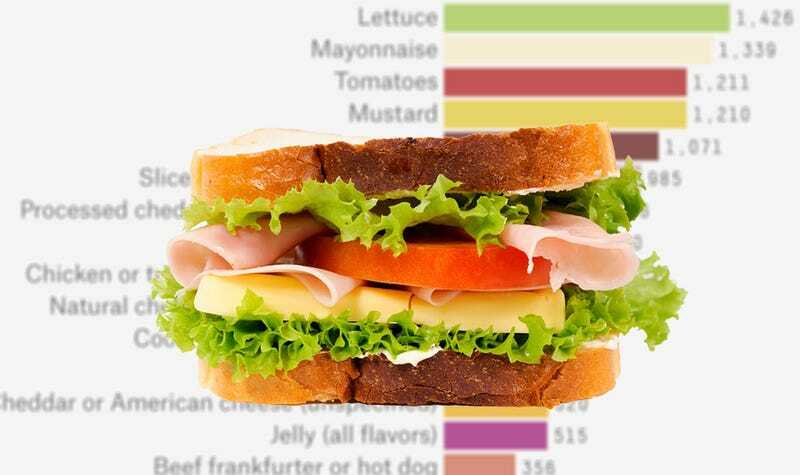 We do, however, have a lovely chart illustrating the top 25 most common sandwich fillings, thanks to the lovely folks over at FiveThirtyEight. Let's take a look. Well damn, there's America's problem right there at the top. We're eating too much lettuce. The CDC report found that sandwiches were major contributors to sodium in the American diet, and looking at rankings its easy to see why. Mayo at number two. Ham, which is pretty much salt with pig flavoring, is the top sandwich meat. While that's all pretty dreadful, keep in mind that this is a survey conducted four years ago, and you're still alive right now. When I was a kid, salt was put on everything and instead of using mayonnaise as a sandwich spread, we'd use it as a sandwich dip. We didn't know any better, and so what we ate didn't hurt us. Plus there was all of that love in everything. Head over to FiveThirtyEight for a more in-depth analysis of the data, including a chart showing which bread types were most popular. Sorry, pita fans.